Pickling is the age old art of preserving and enhancing food by fermentation in a salty and acidic solution. There are many kinds of pickling in all parts of the world. Here I am referring to the traditional and natural pickling processes of Eastern Europe where they use lactic acid producing bacteria (mainly Leuconostoc mesenteroides and Lactobacillus plantarum) to do the job. Lactic acid producing bacteria are found everywhere around us and on us, so it is merely a matter of providing a good environment for them to thrive in. The acidity, salinity, temperature, and the exclusion of oxygen are the factors that determine which microorganisms dominate. The beneficial microorganisms along with the herbs and spices added determine the flavor of the pickle. Pickling also improves the nutritional value by increasing the amount of B vitamins and other nutrients produced by bacteria. I will start by introducing the oldest known pickle. The cucumber has been pickled in India for at least 4000 years. Also known as the dill pickle or kosher dill. This kind of cucumber is small and bitter. 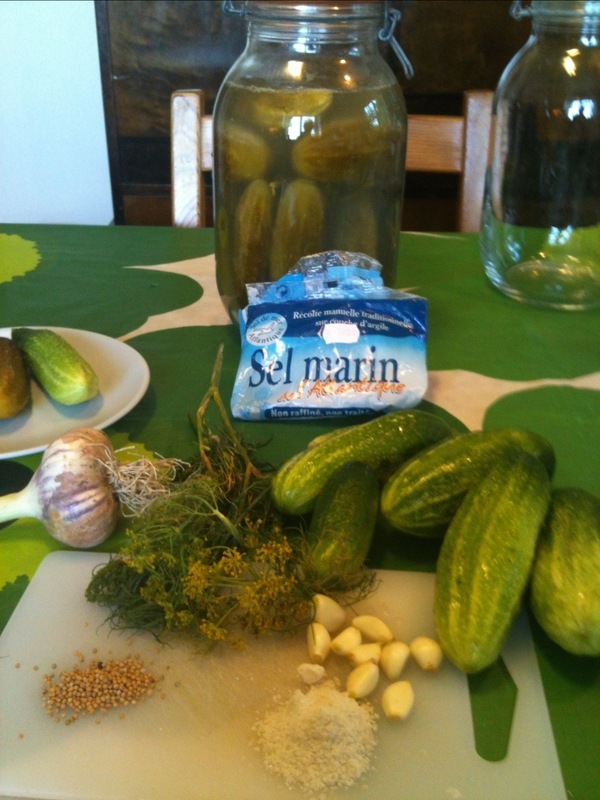 After pickling they become slightly salty with a delicious dill, garlic flavor. And they keep for months. The temperatures are rather important. Here in Sweden the ambient temperatures are low, so the first period in room temperature is around 20 C, but anything between 15 and 25 C will do, it seems. I keep them in the kitchen in a corner on the floor covered with a towel to keep light out. Light kills bacteria. Then they go down to the basement food storage room where it’s dark and the temperatures vary between 10 to 15 C from winter to summer. The salt concentration becomes about 1.5%, which keeps microorganisms from growing, but allows the lactic acid producing bacteria to thrive. The lactic acid acts as a preservative, as well as adding a slightly sour punch to the flavor. Where do these bacteria come from? They are all around us in the environment. In the air, in our food, on our skin etc. We wash the cucumbers to get the dirt off, but even after washing there are enough bacteria left to propagate without competition because of the salty water. The other ingredients also add to the bacteria count. The salt and the lactic acid preserve the cucumbers. They are ready to eat after 4 to 5 weeks. 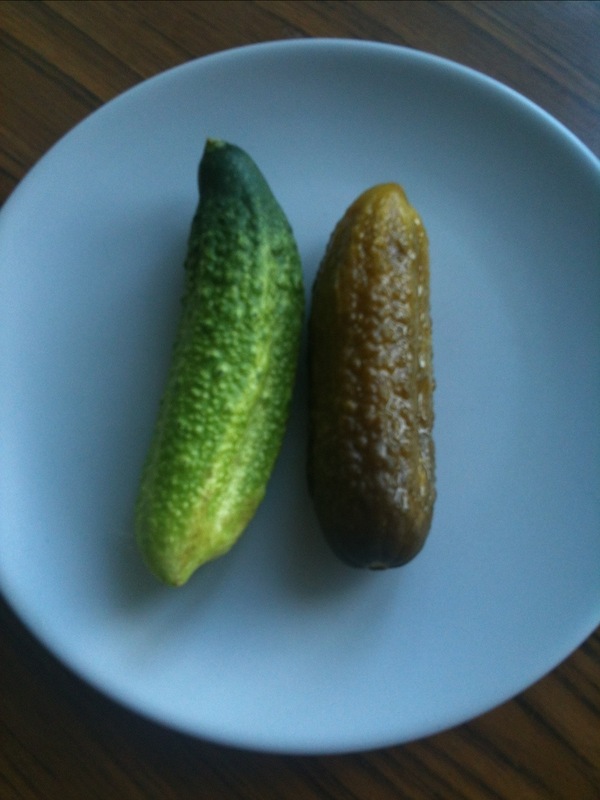 I have had great tasting pickles that were over two years old, but usually they get eaten up quickly. Perhaps the best thing about lactic acid pickling is the flavor changes that come about. My favorite use is for the pickle sandwich – sourdough rye bread with tahini and sliced cucumber pickles. 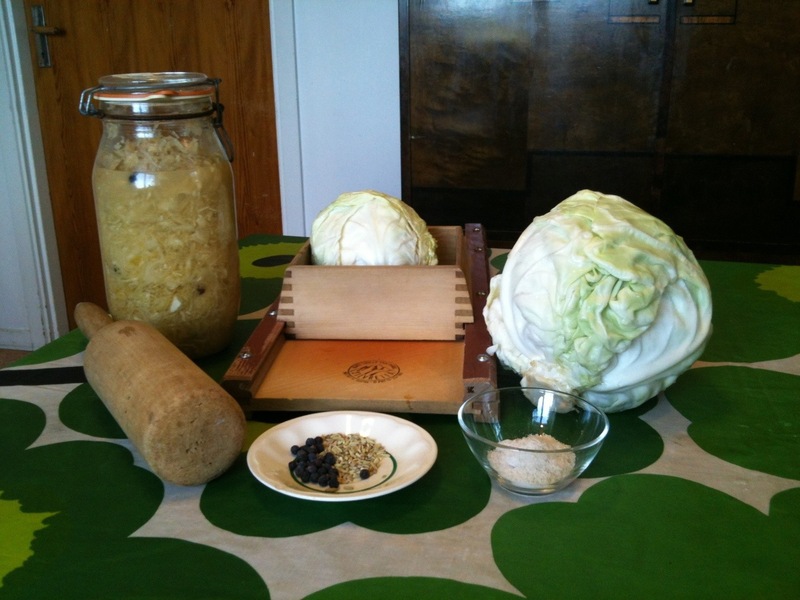 Sauerkraut is a traditional method of preserving cabbage in Eastern Europe and the national dish of Germany. The most popular spice used is caraway seeds. We often make sauerkraut with the addition of only juniper berries, but many jars get different spicings. This batch has a couple of jars with caraway and garlic, and one jar is kimchi, where I mix the basic cabbage salt mash with shredded carrots, white radish, ginger, garlic, and red pepper. Other vegetables, herbs and spices can be added as well. There are an infinite amount of variations to this recipe. Another favorite is the pickled carrot. It can be made in several different ways – such as sliced, diced or shredded. I prefer the later. It can also be mixed with other vegetables. Here is a simple shredded variety. Now place the jars in a warm corner of the kitchen (18 – 22 degrees centigrade), so that the lactic acid bacteria can begin to grow vigorously for about 10 days. They are then moved to the cool food storage cellar, and after 5 to 6 weeks the carrots have fermented sufficiently and are ready to eat. Peeling is what gives the pickle it’s bright orange color, otherwise you’ll get a dirty brown. Kimchi is a Korean version of pickled cabbage. Traditionally it is made with chinese cabbage (whole or in large pieces), other vegetables, ginger and always red pepper. I have developed a different version with a similar taste. 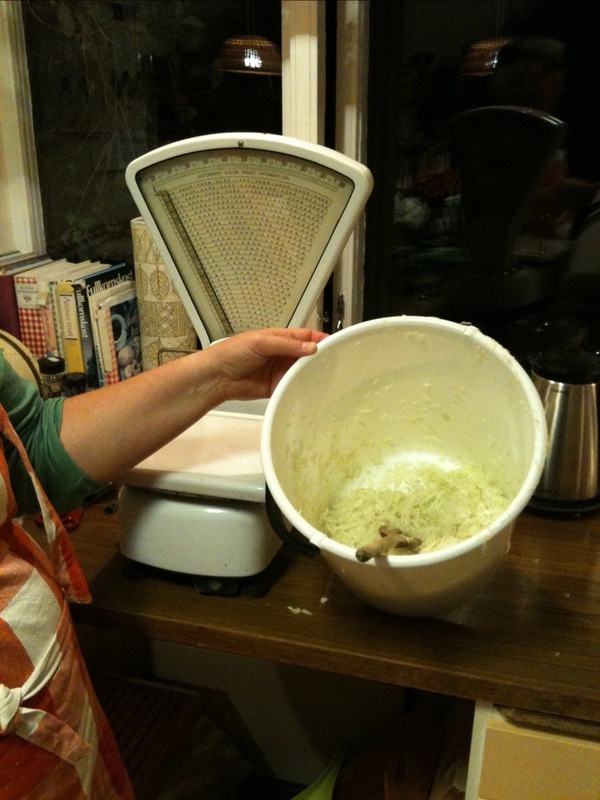 When you make a batch of sauerkraut it’s very easy to make a batch of kimchi at the same time. I’ve tried to make Korean kimchi several times but never been satisfied with the results, until I tried a new idea. When I made a batch of sauerkraut, I took out a portion of the diced and stamped cabbage before the herbs were added, and then mixed in the typical kimchi spices instead. It turned out great. I won’t post a recipe now, as I am still experimenting with the mix of spices, but suffice it to say, follow the sauerkraut recipe I posted earlier but change the spice mix. This time I used 3 kilos cabbage, one small daikon radish, one carrot, 6 cloves of garlic, a chunk of ginger, 6 tiny dried strong chili peppers and 48 grams salt. Everything was chopped, ground, mixed, and sealed into canning jars for wild lactic acid fermentation – 6 days in the kitchen then in the food cellar. The kimchi is ready to eat in 5 to 6 weeks. Wait longer, and it will taste even better. 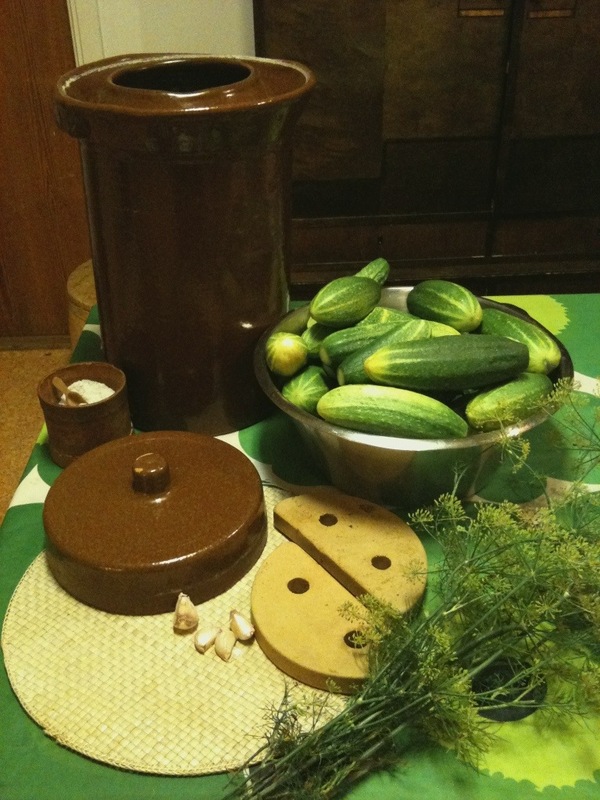 If you have too many cucumbers, and many more are growing in the garden, you can pickle a very large batch in a Harsch pickling crock. 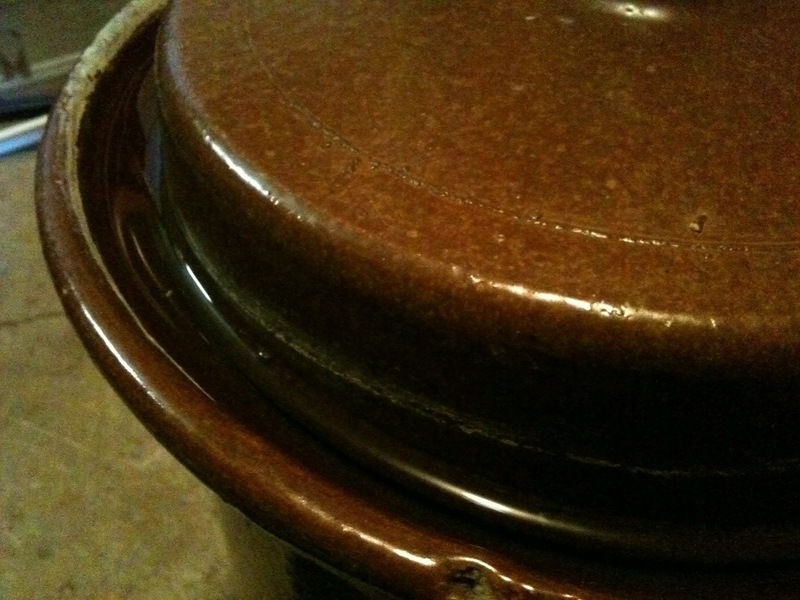 As you can see, the lip of the crock is formed as a V to put water in and then the lid. This makes a waterlock – air cannot get in and excess gasses can bubble out. These are great for making all kinds of pickles, sauerkraut and even miso. They are also large and cumbersome – hard to move around and don’t fit very well in a refrigerator. 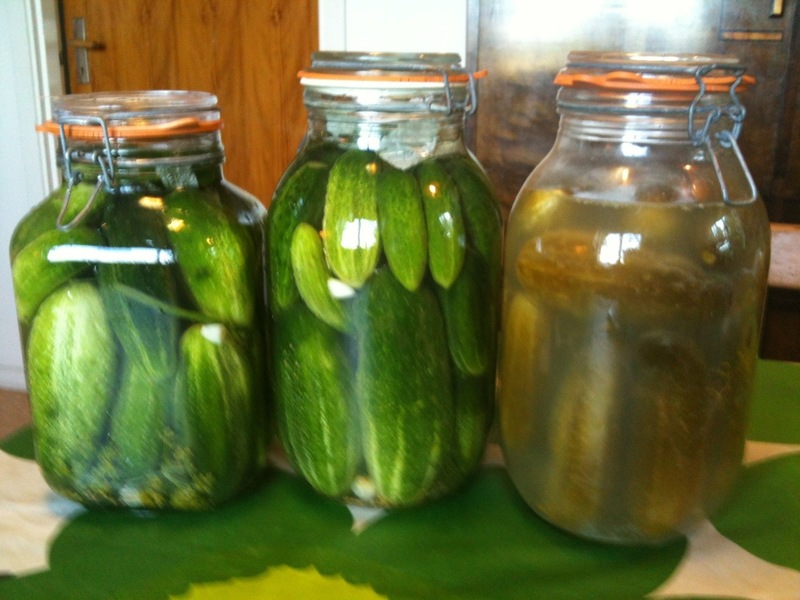 They also tend to make too much – a lot of pickles to eat, sell or otherwise get rid of. 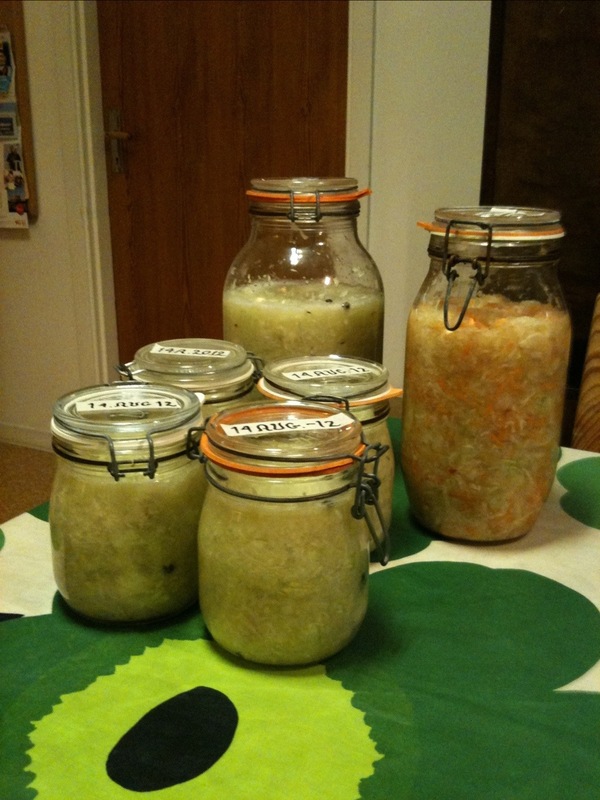 These are just a few of the many lactic acid fermentation recipes. You can adapt these or find other recipes for just about any vegetable available. Experiment and find your own favorites. You can then use the pickles in so many ways – as a relish, in a chutney or straight as they are. Very interesting! I’ve never had a jar explode, but the contents often fizz out on opening. 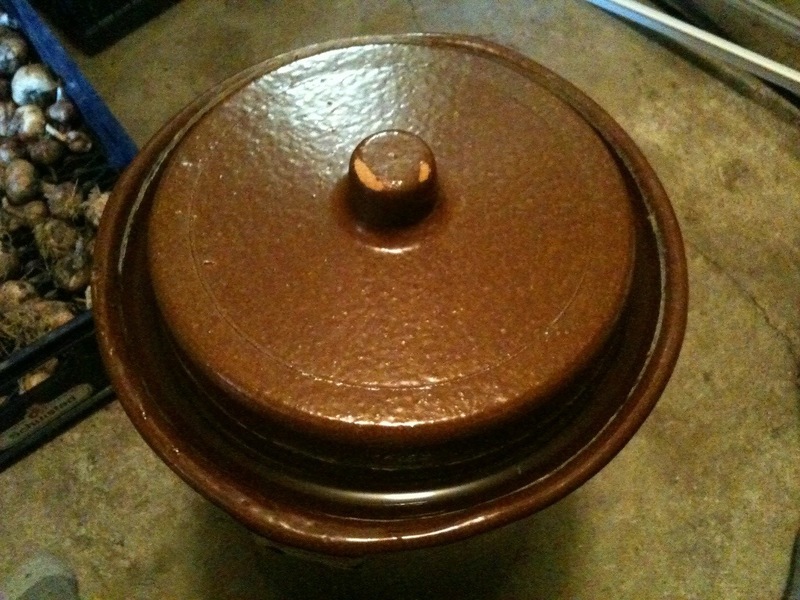 I cover the lid with a towel on opening first time and a spoon to scoop out the fizzing top part. After that no problems. Be carefull! I have tried making sauerkraut using your recipe in screw jars last spring, which worked out fine but the screw lids coudn’t release pressure so they kind of broke, anyway only one of four jars got conterminated with mold. Then I bought jars similar to yours from fido which work better. 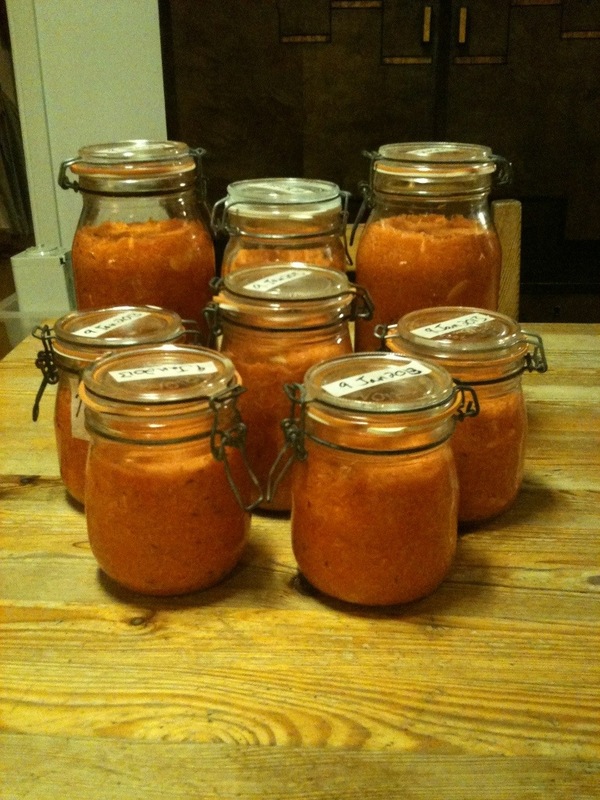 I made pickled rootbeet, shallots, carrots and turnip cabbage in the summer. In my last round I tried pickling cucumbers and green beans. They all turned out fine and once opened they last well in the fridge and are a good accompaniment to supper or can be turned into a salad along other vegetables. The only problem is that I don’t have a storeage cellar or any other room with temperatures below room temperature and above fridge temperature, so I put the pickles in the fridge once I think they have been fermented enough. Your page gives good hands on information on pickling and I like it a lot. Thank you. I appreciate your comments, and I’m glad your pickles turned out good, except for the broken jar and some mold. I should mention that I have a few mishaps too sometimes. Please share your experience with me. I would be thankful. 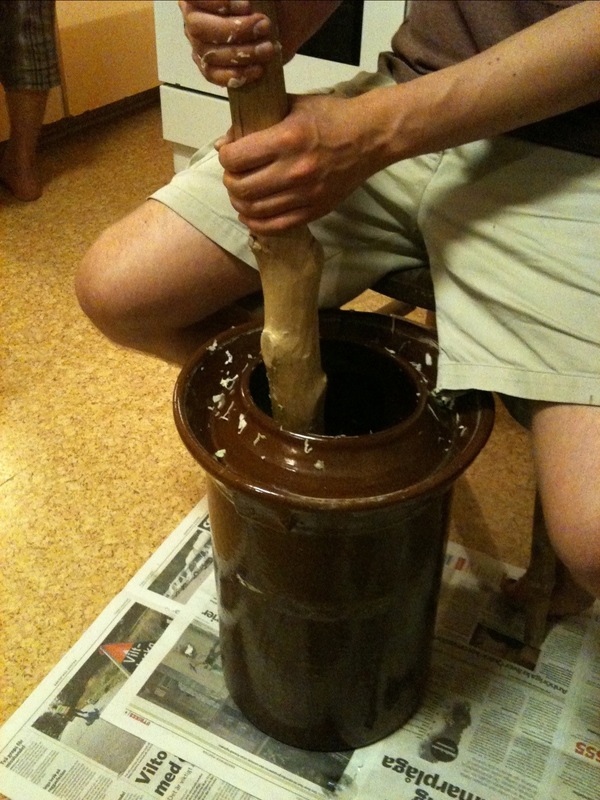 I also asked my mum how my grandmother used to make sauerkraut. 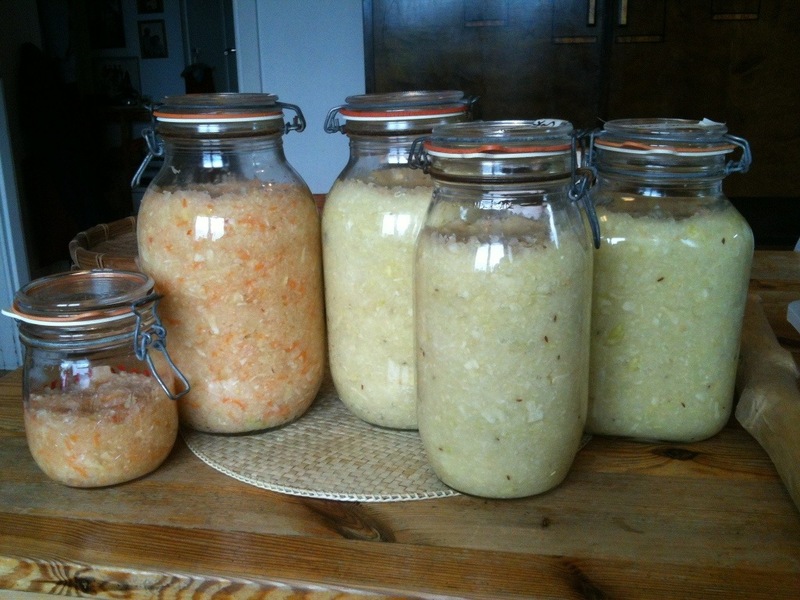 In the old days they say the people in the south of Germany had Sauerkraut everyday in winter, but my mum says only a few times a week when she was growing up 50 years ago. In the North where I live now pickling green beans was very popular back then. My grandma had a big croque and pressed the cabbage in, put a drop lid directly on the cabbage and put a weight on top so the cabbage would stay under the liquid level. Anyway I would much rather prefer to make it your way, because jars are easier to handle and I can store them in the fridge when they are done fermenting. 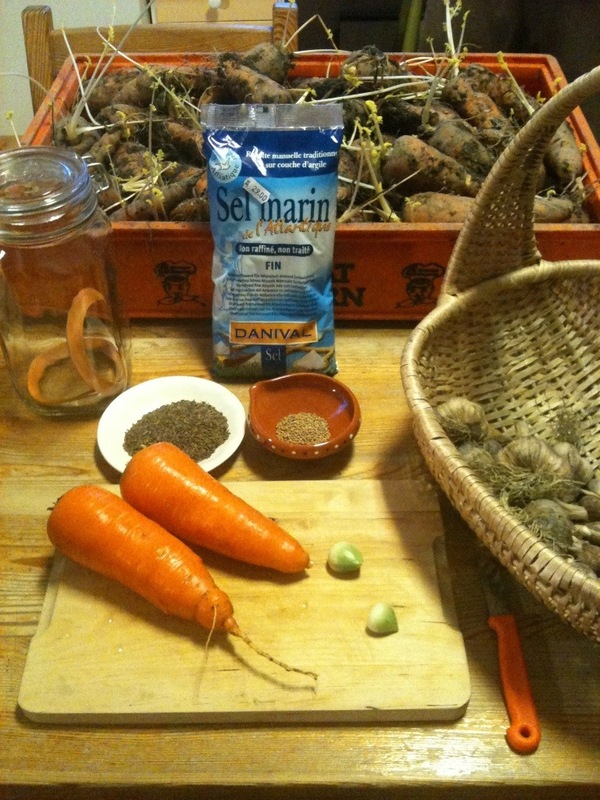 I learned traditional pickling from a German lady here in Sweden – Annelies Schöneck. That was a long time ago. She was the one that recommended glass jars. I’ve never heard of any exploding altho a lot of gas can build up. And they sure are easier to handle. 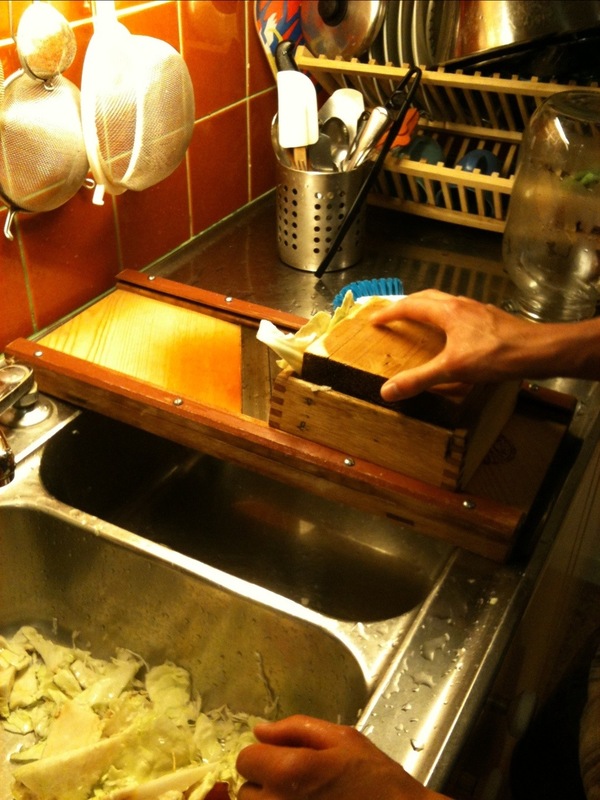 On the other hand, mold will grow on the top if the seal is not good enough and air can leak in. If it is just a little bit I take the mold off and eat the pickles. Sometimes it is more and ruins the whole bunch which is thrown out on the compost. When pickling green beans and such we always cook them very lightly, let cool then pickle as usual. There are many ways to do this kind of pickling and all are good. Good Luck! Are the shred carrots crunchy? Thanks? 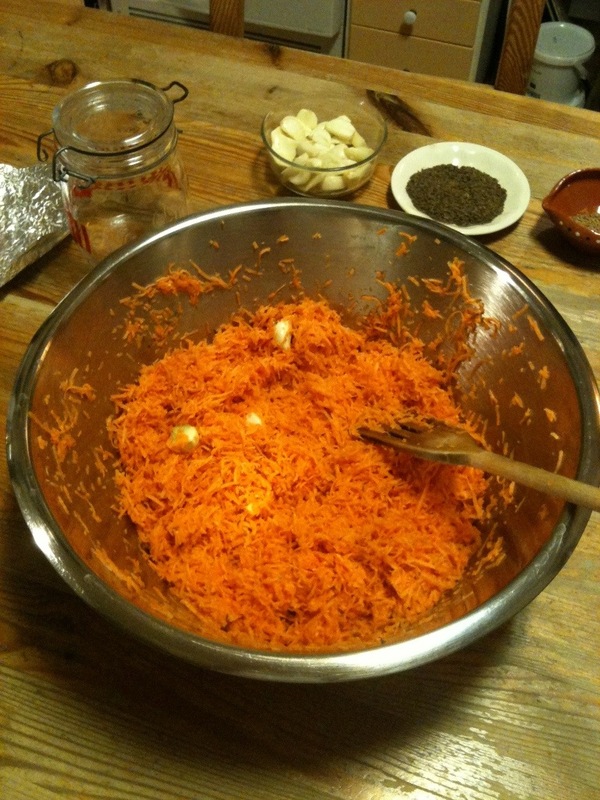 My next goal is to try to make some pickled carrots, from your website…. The pickled carrots are crunchy and soft too – al dente. if you want crunchier, shred them coarser.